The Riu Palace MEXICO has been built on a spectacular white sandy beach with turquoise waters in Playacar and is just 2.5 km from Playa del Carmen and just 5 minutes from the city center. At this luxurious hotel you will have unforgettable moments which you can cherish forever. The hotel was totally renovated in 2012 and is aesthetically decorated in line with the traditional style of Mexican estates. The 434 rooms are spacious and comfortable and the gardens will give you the sensation of being in a tropical atmosphere surrounded by palm trees, white sand and turquoise water. The junior suites are split level with a sitting area and the bathrooms have a hydro massage tub. The suites have a mini-bar, liquor dispenser, safe, free WiFi and a balcony or patio. The RIU Palace Mexico has 5 bars including a swim up bar, waiter service at the pool, 24 hour room service and a 24 hour sports bar. The all-inclusive plan invites you to sample our main buffet restaurant with a wide variety dishes and a selection of fine a la carte restaurants including Japanese, Steak House, Fusion “Krystal”, Mexican and a new Italian restaurant. 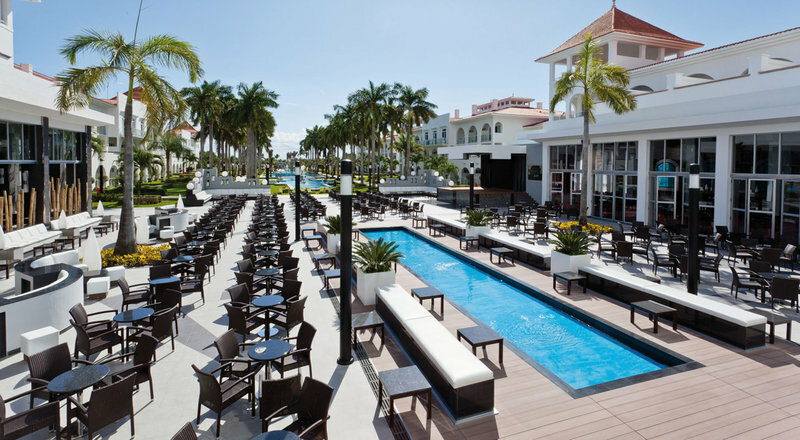 The Riu Palace Mexico offers an excellent range of entertainment for adults and children. This includes the RiuLand program for the little ones between the ages of 4 and 12 and fun daily activities for adults. You can wind surf, kayak, body boarding, snorkeling and scuba lessons in the pool. At night they have entertainment and live music you can even go and dance the night away to excellent music in the “La Piñata” club. For Golf lovers we recommend Playacar Golf Club, undoubtedly one of the best courses in the region. There’s no better way to keep fit than going to the hotel’s gym and regaining strength afterwards in the Jacuzzi and sauna. You can also de-stress by enjoying the various treatments and massages at the “Renova Spa.